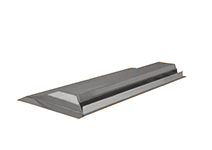 Are you looking for durable and cost-effective ventilation products? Then you’ve come to the right place. Southeastern Metals™ not only offers the highest quality vents, soffit strips, louvers and roof jacks in the industry, our customers receive outstanding service with every call. This is all in line with the standards and mission of our parent company, New York-based Gibraltar Industries, a leading manufacturer and distributor of building products worldwide. Gibraltar ensures that all our products are precision-engineered and manufactured to the highest quality standards to promote greater strength and durability while enhancing overall structural integrity after installation. They also guarantee that our installation methods have been evaluated and approved by major roofing manufacturers. Southeastern Metals™ is pleased to introduce the following new ventilation products to our line-up of quality metal building components. For more information, contact Southeastern Metals at (800) 874-0335, and be sure to ask for these quality ventilation products from your local distributor!